Another sunny day, another walk yesterday. Since I won’t have a vehicle in Bali, I’m trying to prepare my feet for all the walking I’ll be doing. More than that, I love the time outside and soaking up the sounds of the birds and seeing what surprises will be in store. It was Friday evening and as I was walking, I thought back to my experience of going to a movie alone for the first time. A couple years ago, I wouldn’t have been caught dead doing something solo on a Friday night! Not even a walk… And here I was a couple years later, walking alone and loving every second of it. There were a couple occurrences that happened during my walk that made me smile and think. As I got closer to Discovery Park, I saw a woman leaning over a big hole, digging at something. Her dogs immediately came up and invited me to pet them – I happily obliged. I knew it would be odd, and possibly rude, to ask her, “What are you doing?” Strangers just don’t do that. Within seconds, she looked at me and said, “I’m trying to read this meter and I can’t.” Did I accidentally ask my question out loud and not in my head? Funny that I wanted to know and seconds later, I knew. I kneeled down and helped her scrape off the dirt, telling her it might help to add moisture to clean it more. She licked her thumb and it did become cleaner, but she still couldn’t see the numbers. She asked if I had good eyes. I felt silly thinking that if I told her I had good eyes and couldn’t read the numbers, I’d be a fraud. So I didn’t say anything, got closer, and was relieved when I could see the numbers clearly. Yes, still good eyes. All the sudden a little boy came running out asking what we were doing. His well-dressed mother came chasing after him, but was also curious what we were doing. Both of the women asked if I lived in the neighborhood and I said I was only dogsitting. The house we were standing in front of had just been sold and the mother of the boy happened to be the new tenant. Houses in Magnolia are not cheap, and the way she was dressed and perfectly polished, I knew she would have been shocked if I had said I lived in Magnolia. She was new to the neighborhood, so I could see her excitement meeting her new neighbor. She apologized for her son running up to us and mentioned that “he isn’t supposed to go past the mailbox.” I looked at where the bright red mailbox was and it was about 30 feet up from the sidewalk. At this point, I knew it was my time to continue on my walk. The two new neighbors were starting a connection and I needed to shake my head at the thought that we live in a time when kids are so constricted, the sidewalk is off limits. 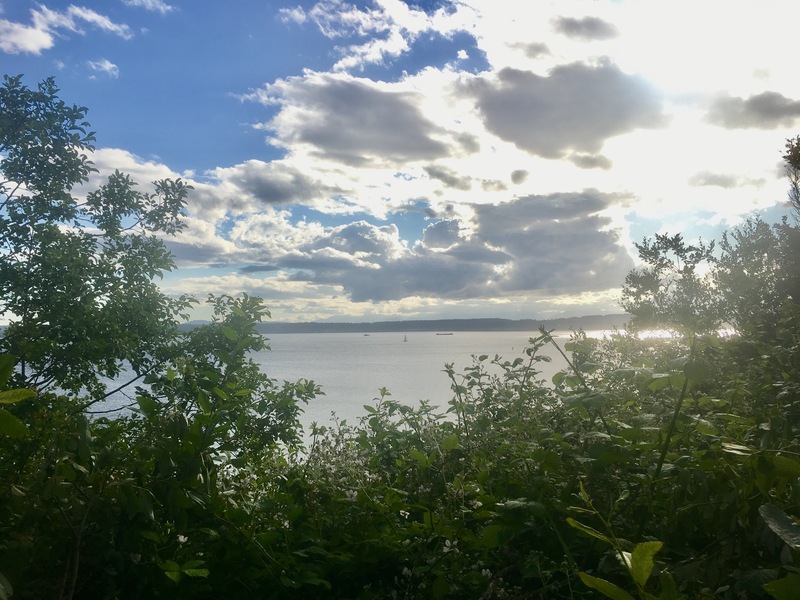 I began my journey through Discovery Park and wondered where I’d end up. The North Bluff? The Lighthouse? I was ready to discover Discovery Park. No constrictions about it. After several forks in the path, I ended up on the beach. Of course I’d end up by the water. And of course I’d end up face to face with a Great Blue Heron. Blue Herons are extremely special to me. A couple years ago, I was asked what my “spirit animal” was. Spirit Animal? What kind of hocus pocus is that? The person who asked me said that your spirit animal is an animal you relate to and is an “otherworldly guide.” There aren’t online tests to figure out what your spirit animal is, you just know. It’s based on a feeling. For me, it was fun figuring it out. At first, I immediately said what a lot of people tend to say when they’re discovering what their spirit animal is: “I’m a dog! Friendly, energetic, and happy! !” But the more I thought about it, the more I knew I was a bird. For a while I was convinced I was either a raven or an owl. I have an odd fascination with ravens or crows because they’re intelligent and have an interesting folklore. I read a Native American myth called, “Rainbow Crow” and felt like it could be my spirit animal. But it still didn’t feel right. I didn’t want to be an animal that people were always irritated with. I know, it’s weird that I took this so seriously, but hey, that’s just who I am. Then I went on my first solo hike and came across the most beautiful owl. “Hmmmm, perhaps I’m an owl,” I thought. I loved that they represent wisdom, but they also happen to symbolize death, don’t live near water, and they’re nocturnal. I love owls, but I am not one. Back to the drawing board. It was a walk around Greenlake when it finally hit me. I ran into my favorite bird, a Blue Heron. My spirit animal is a Blue Heron, no question about it. I was surprised it took me so long to figure it out. It just felt right. I’ve always loved the Greenlake Heron and I get excited every time I see one of these majestic birds. I loved the fact that Herons aren’t easily found, they represent patience, and they always seem to be soaking up the sun. Not to mention, they’re blue – my favorite color and the color of my eyes. After I figured out what my spirit animal is, I did a little research on them and what they symbolize. It all made sense. 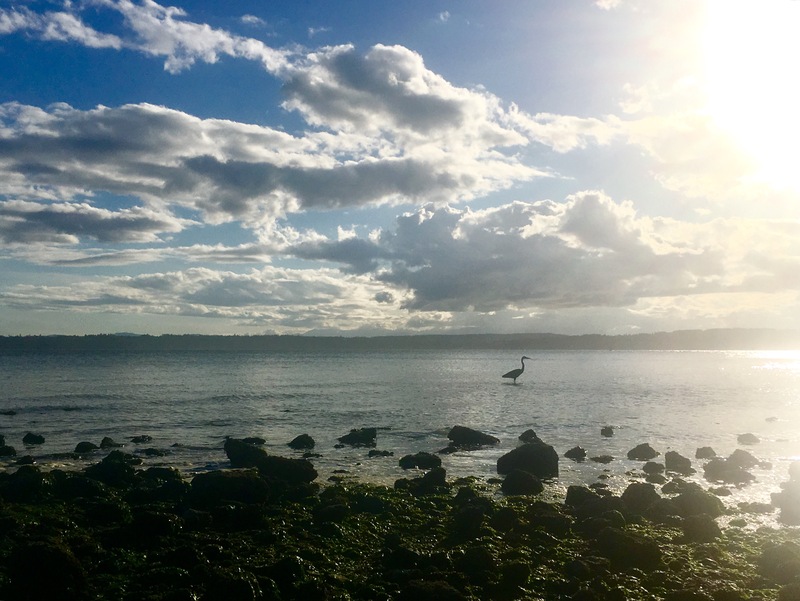 When I reached the beach in Discovery Park and watched the Blue Heron standing in the sunlight while the tide was coming in, I realized I was doing the same thing as my favorite bird. Peacefully standing in the water, enjoying and observing, letting the sun warm us up. This ability enables you to follow your own path. Most people will never quite understand the way you live because on the surface it seems to be unstructured without stability or security to it. It is, though, just a matter of perspective. There is security underneath it all, for it gives you the ability to do a variety of tasks. If one way does not work, then another will. This is something you seem to inherently know.